Studying Painting with Ancient Techniques in Florence is an important experience as the town was the cradle of art in the Middle Ages and Renaissance and the great masters such as Giotto, Michelangelo and Leonardo da Vinci worked here to create their masterpieces. Surely it is important and also culturally and aesthetically enriching to know about the techniques, materials and styles of these great masters. The aim of a course of Painting with Ancient Techniques in Italy and particularly in Florence is that of reconnecting to the great Art of the Renaissance and enable students to create personal and modern works by using ancient techniques: egg tempera and gold-leaf. Preparation of egg tempera, preparation of the wooden board for the painting, transfer of the drawing onto the board, “bolo” preparation for gold-leaf, are all essential parts of the work tha the student wil do. Courses start every Monday, and lessons are held in the afternoon: Monday to Friday from 3 p.m. to 7 p.m. The minimum enrollment is 2 weeks for the Basic and Semi-intensive type, and 1 week for the Intensive type. All our teachers speak Italian, English and Spanish. It is possible to book private lessons. The course is based on the “Book of Art” by Cennino Cennini (1370-1440) and introduces the paintings techniques in use from 1300 to 1500, through the copy of ancient paintings to learn how to use egg tempera and gold leaf. The whole process for the realization of the painting is covered, from the preparation of the supports to the painting. Egg tempera is a very stable type of paint composed of pigments mixed with a water-soluble binder (normally a sticky substance like egg yolks). This type of paint dries very quickly and lasts over time. 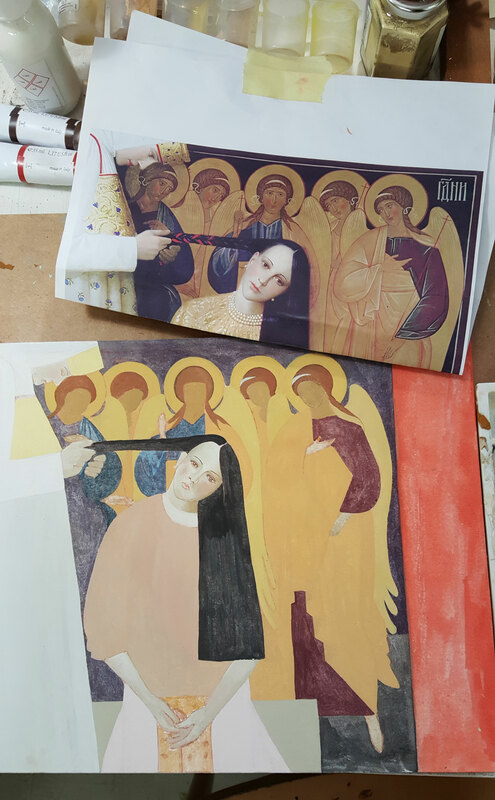 There are art works painted in egg tempera that date back more than 2000 years ago. The egg tempera was the most used pictorial method until after 1500, when it was replaced by oil colors. Gold leaf is a thin sheet of hammered gold used for gilding, an artisan process that must be done by hand and has remained unchanged for hundreds of years. The gold leaf is traditionally used to decorate statues, paintings, frames, jewels and architectural elements.